Numbers can be converted to their SI equivalent values and from SI values to any other unit of measure. 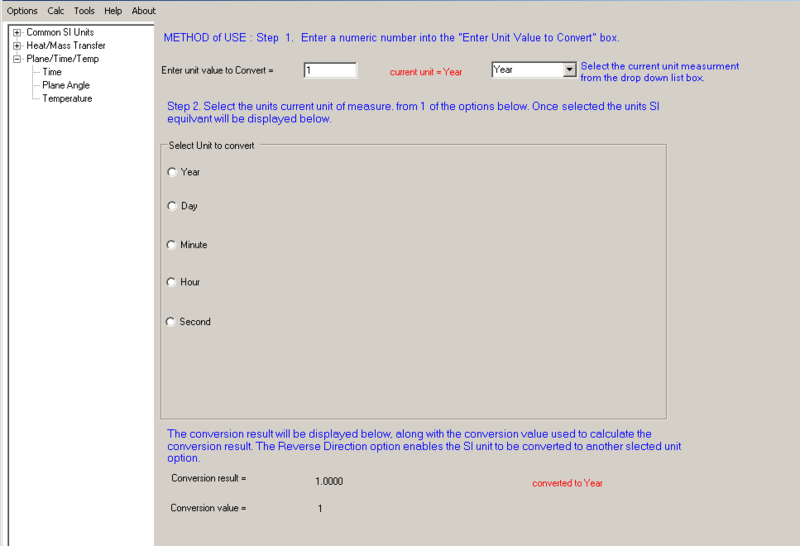 The REVERSE DIRECTION check box :- If checked , units are converted from their SI value to the unit selected. In the example above the value 1 has been converted from it's km^2 unit to its SI unit measure of 1000000 m^2. 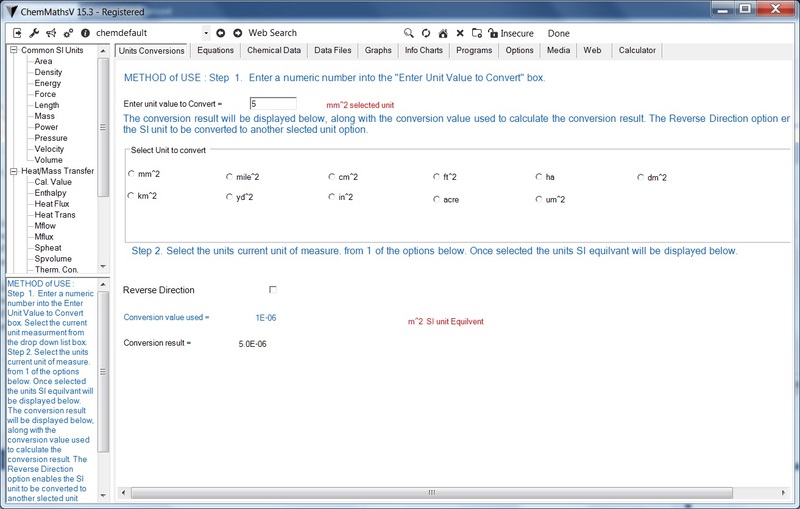 The conversion factor used is also displayed. UNIT SYMBOLS mm - millimeter km - kilometer yd - yard cm - centimeter in - inch ft - foot m - metro ha - hectare kcal - kilocalorie Btu - British thermal unit Cal- calorie MJ - mega joule (1,000,000 joules) g - gram mg - milligram kg - kilogram gal - gallon KJ - kilojoule (1000 joules) kWh - kilo watt hour hp - horse power lbf - pound force W - watt J - joule h - hour s - second mN - milli newton kgf - kilogram force tonf - ton force kN - kilo newton N - newton min - minute psi - pounds per square inch atm- atmosphere dyn - dyne l - liter mmHg - millimeters of mercury Plane\Time\Temp Units Method of use : * Enter a number in the “Enter unit value to convert” input * Select the entered units measurement from the dropdown list box. *Select a unit to convert to from the displayed options. *The result will be displayed. In the case below 1 year is convert to 1 year.